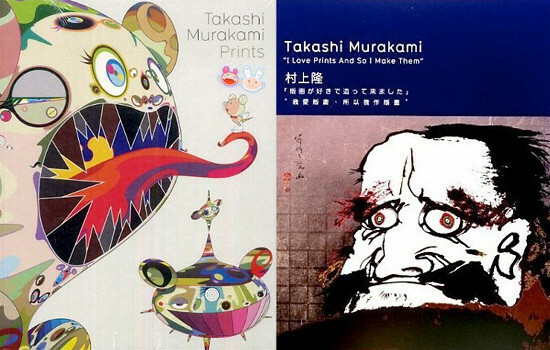 » ‘Takashi Murakami Prints’ vs ‘I Love Prints and So I Make Them’: What’s the difference? 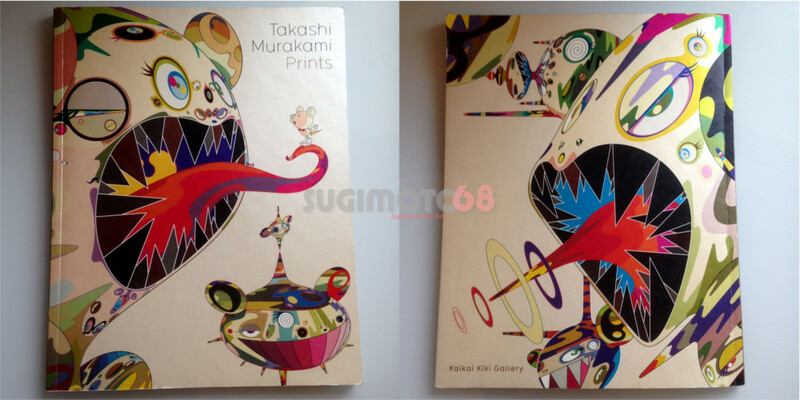 ‘Takashi Murakami Prints’ vs ‘I Love Prints and So I Make Them’: What’s the difference? What is red and pink and green and yellow and gold (leaf) and platinum and has ears and eyes and teeth all over? Why, the Murakami print collection, of course! Murakami has a big reputation for unleashing and moving multi-million dollar art pieces; however, he has always maintained a soft spot for prints. His fixation benefits a certain portion of the 99%, since it allows us to collect Murakami art. In fact, as Murakami points out regularly, he created the My First Art series for the average collector, who lacks a big budget. The runaway success of his print collections inspired Murakami to hold two exhibits consisting entirely of his consumer commercial prints: Prints “My First Art” Series (2008) exhibited his offset mass-production prints created between 2001 and 2008; and I Love Prints and So I Make Them (2009) showcased his entire lithograph and silkscreen series created between 1996 and 2009. What is red and pink and green and yellow and gold (leaf) and platinum and has ears and eyes and teeth all over? Front and Back pictures of the Sherlin covers on my well-worn copy of Takashi Murakami Prints; Like mini versions of the Homage to Francis Bacon prints, right?? However, if you missed the brief exhibitions (as I did, alas) there is still hope! Yes, by acquiring the exhibition books aptly named Takashi Murakami Prints:“My First Art” Series (2008) and I Love Prints and So I Make Them (2009), both published by Murakami’s Kaikai Kiki Gallery in Tokyo. Sure they stand in as the distant third cousin of the actual exhibits, but you can still simulate the exhilaration of the shows through perusing the gorgeous texts and browsing the pictures on the Kaikai Kiki Gallery website. Both catalogues contain (somewhat) astounding insights into the mind of Murakami and his creation process by tracing the history and (vaguely described) struggles of his printmaking process. 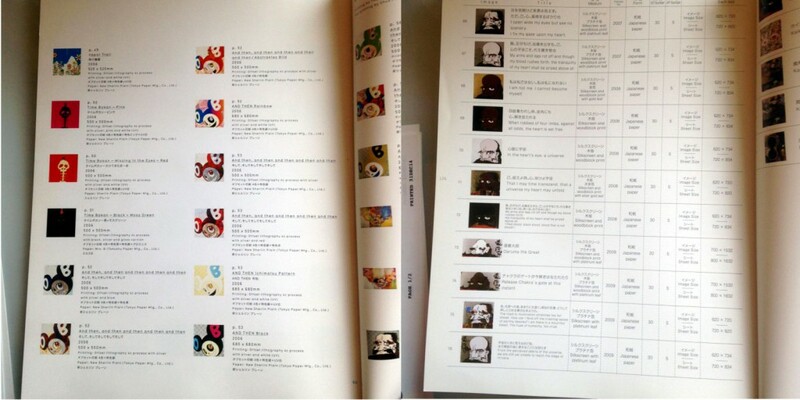 The texts contain beautiful pictures of the prints—detailed to the point that you can read the tiny copyright information and see the evolution of Murakami’s eponymous signature. You also get catalogues complete with release dates, printing processes, print dimensions and edition/proof counts. Although one wishes he would list the original retail prices;) Both texts also are multilingual containing Japanese and English. I Love Prints adds Chinese to the mix. A nice touch is that the cover that graces Takashi Murakami Prints is composed of one of Murakami’s favored print papers, Sherlin, and benefits from his offset printing expertise with the shiny cover. Do you know the significance of the Golden Dob (2007)? So on to the differences. Well Takashi Murakami Prints: “My First Art” Series (2008) collects his offsets (referred to as ポスター ‘posters’ in Japanese) while I Love Prints and So I Make Them (2009) collects his lithos and silkscreens (or 版画 hanga in Japanese). The textual content has a larger distinction. My First Art contains Murakami’s recollections and musings about his early print productions while I Love Prints add the voices of Murakami’s key printmaking managers alongside Murakami’s. All in all, fascinating reads that provide a bit of a peek behind the curtain of Murakami’s Kaikai Kiki Factory. You learn Murakami otaku trivia such as what was the first Murakami print to successfully use the now ubiquitous cold foil stamping process? Or what significance does the Murakami Daruma series have? 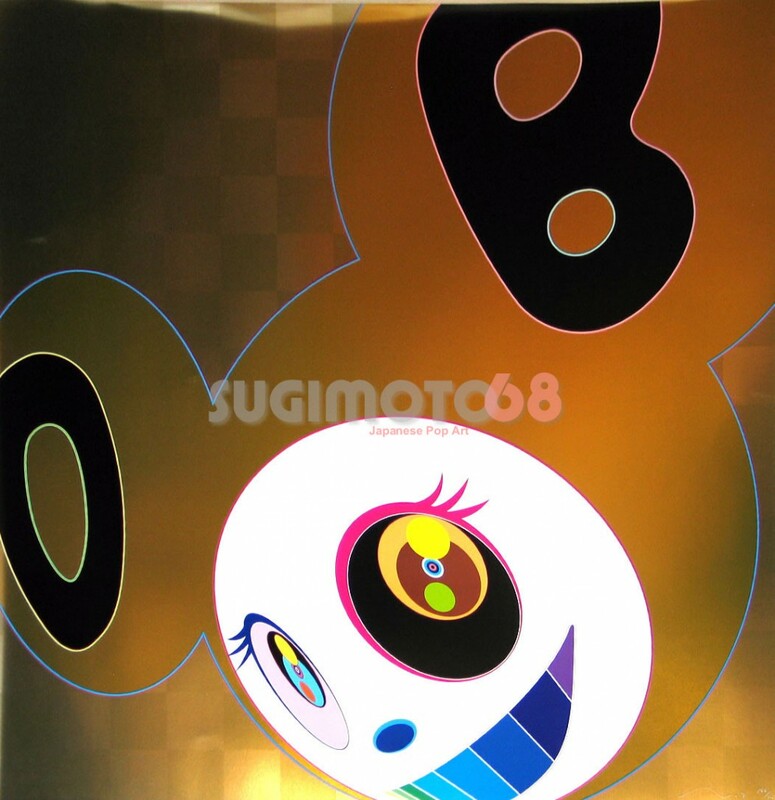 And even, how long does it take to complete a single run of Murakami silkscreens? You can glean all of these answers and more from these volumes. Both Takashi Murakami Prints: “My First Art” Series (2008) and I Love Prints and So I Make Them (2009) contain information indispensible to the Murakami print collector or fan. Take the opportunity to purchase these books for yourself or as a gift for any fellow art fan.